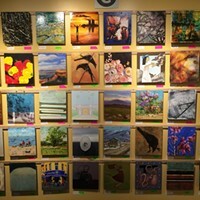 Photos and thoughts from Art Access' yearly auction. This past Friday, we were greeted with gusts of wind coming in every direction, as those who braved the face-blistering howls made their way through the Salt Lake Gallery Stroll. This month, I made my way over to Art Access for their 300 Plates fundraiser and exhibition. If you're not familiar with this show, the basic idea is that roughly 160 prominent and rising artists in the community purchase and sign up to create original artwork on an 11" x 10" plexiglass plate.